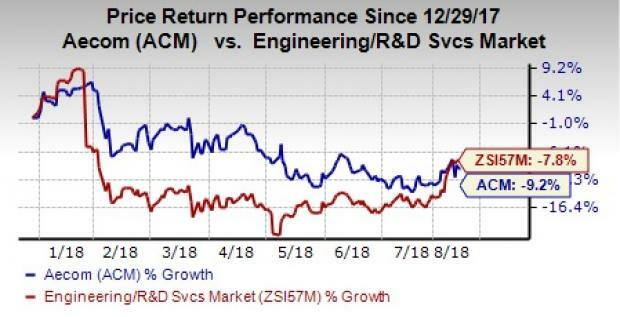 Can AECOM’s (ACM) Latest ASR Agreement Help Stock Revive? AECOM ACM, which recently reported third-quarter fiscal 2018 results with 20.5% year-over-year decline in earnings, seems to be making efforts to boost investor-friendly moves. Recently, the company unveiled an accelerated share repurchase (“ASR”) contract, which led to an upward revision of its shares by 0.2% during yesterday’s after-market trading session. According to the latest agreement with JPMorgan Chase Bank, National Association (JPMorgan), the company will repurchase $150 million worth of its common stock. The latest agreement reflects the initial repurchase under its $1-billion authorization announced on Sep 21, 2017. Since August 2011, the company purchased a total of 27.4 million shares for an aggregate cost of $660.1 million (as of Jun 30, 2018). AECOM remains confident about the ongoing strong business fundamentals that will drive its shareholders’ value. The company has been witnessing robust prospects across most of the business segments, adding to its growth momentum. All the three segments of the company recorded growth through the nine months of fiscal 2018, with strong growth in building construction and steady improvement in Americas design business. At the end of the fiscal third quarter, the company recorded a backlog of $54 billion, reflecting a 16% year-over-year increase. The company’s solid backlog levels, which are a key indicator of future revenue growth, indicate significant opportunities in the forthcoming quarters. During the fiscal third quarter, it secured wins worth $9.4 billion and recorded a book-to-burn ratio of 1.7%, with significant contribution from all the three segments. The company’s shares have dipped 9.2% year to date, comparing unfavorably with the industry’s 7.8% decline. That said, the investor-friendly moves along with growth opportunities in the infrastructure and defense markets will benefit AECOM, and reflect in its share price going forward. Currently, AECOM carries a Zacks Rank #3 (Hold). Some better-ranked stocks in the industry are Gates Industrial Corporation plc GTES, Jacobs Engineering Group Inc. JEC and KBR, Inc. KBR, each carrying a Zacks Rank #2 (Buy). You can see the complete list of today’s Zacks #1 Rank (Strong Buy) stocks here. Gates Industrial’s 2018 earnings are expected to increase 42.2%. Jacobs’ earnings estimates are expected to grow 34.6% for fiscal 2018. KBR surpassed earnings estimates in three of the past four quarters, resulting in an average positive surprise of 12.26%.